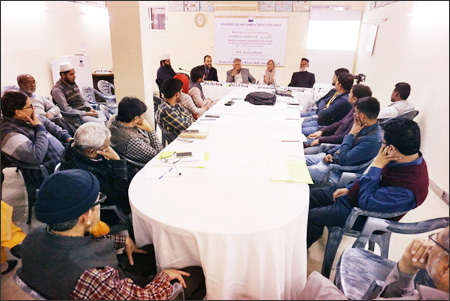 The Institute of Objective Studies organised a lecture based on the review of the document, Madina Charter: The First Written Constitution of the World (An important document of the Prophet (PBUH)’s time by Dr. Muhammad Hamidullah), at the conference room of the Institute on February 28, 2019. 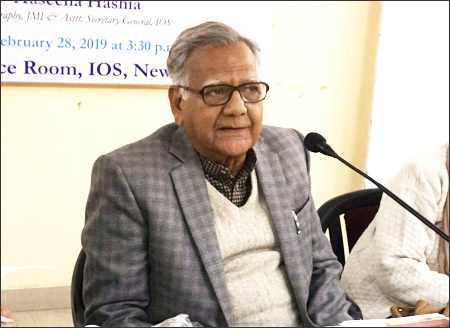 Delivering the lecture, Prof. Hasina Hashia, professor of Geography, Jamia Millia Islamia and assistant secretary general, IOS described the charter as a universal document accepted by all religions. Whosoever read it, he accepted it because the document gave the concept of statehood, conferred rights on the citizens and defined their duties. The concept of a civilised nation was first visualised by the Madina Charter. 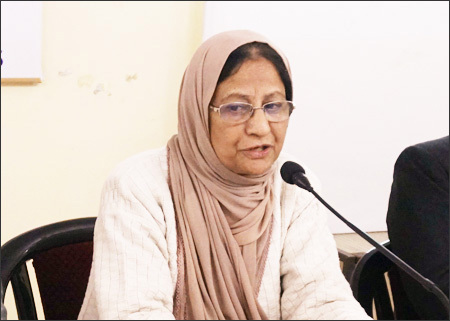 She said that it was Dr. Muhammad Hamidullah who proved that the charter was the first written constitution of the world, adding that the document was based on the historical writings and memories of Ibn Ishaq and Abu Ubaid. They produced the entire document word by word in their respective books. She observed that nations possessed their own fixed rules of government and administration of justice, and were controlled by them. Whenever such rules were collected in writing, they took shape of books. Aristotle referred to the Constitutions of 158 of his contemporary city/states in many countries, including India. From among these monographs, only the Constitution of Athens had come down to us, she added. It was discovered in Egypt in the recent past and was published in 1891. But, none of these enjoyed the dignity of an authoritative Constitution of a state issued by the sovereign of the country. Prof. Hashia observed that in the first year of AH, i.e., the very first year of the holy Prophet (PBUH)’s migration to Madina, he (SAW) had a deed drawn up which had been referred to as a Kitab or Sahifa in the deed itself, and obviously which was written after consultation with the people concerned. In the deed, there was a detailed discussion of the prerogatives and obligations of the ruler as well as of other immediate requirements. The document was a “code of action” or a “chart of duties”. In fact, she said, it amounted to a declaration of the city of Madina as a city/state for the first time, and to the laying down of a code of its administration. This document contains 53 sentences, or, to use legal terminology, sections; and is an inevitable example of the legal language and the manner of document writing of the time. She noted that the importance of it had been felt by European Christians even more than by Muslim historians. Besides, Wellhausen, Mueller, Grimme, Sprenger, Wensinck, Caetani, Buhl and others, an English historian in the course of a short history of the world, had felt it necessary to mention it in considerable detail. She said that when the Prophet (PBUH) started his preaching and reformative work in the holy city of Makkah and proposed a change in the beliefs and practices existing for generations, he first surprised his countrymen, then he was hated and in the end, he encountered their opposition and hostility. From the very first day, his mission was universal in its nature and the possibility of its spreading immediately and with ease over the whole of the known world, particularly the Iranian and the Roman (Byzantine) empires, was clearly discernible. The holy Prophet (PBUH), in the course of his preaching, used to predict, to the people of material interests, the conquest of these empires. But in as much as he was a junior member of a comparatively poorer and weaker clan, it was difficult for him to be accepted as a leader. According to Dr. Muhammad Hamidullah, the holy Prophet (PBUH) had appointed at the time of the pledge of Aqaba twelve Muslims to represent him in tribes, one in each, and thus tried to create a centralisation of power. But, apart from this, every tribe had its independent sovereignty and decided its own affairs in its own saqifa or shed, and there was no central urban organisation in the city. Through the efforts of trained preachers a considerable number of people in the city had accepted Islam in the course of three years. It was in this situation that the Prophet (PBUH) came to Madina, where the following problems demanded urgent solution. 1. Definition of the rights and obligations, his own as well as those of local inhabitants. 2. Arrangement for the settlement and livelihood of Makkan refugees. 3. An understanding with the non-Muslims of the city, particularly the Jews. 4. Arrangements for political organisation and military defence of the city. 5. Compensation for the loss of life and property suffered by the refugees at the hands of Quraish of Makkah. She said that in this document, the holy Prophet (PBUH) secured for himself the highest judicial, legislative, military and executive powers, but a very important and remarkable difference between this authority and the autocratic royal authorities of other countries was that materialism had no part to play here. The holy Prophet (PBUH) introduced moral elements in politics. He regarded God as the source of authority and considered himself as His messenger and agent; and alongside with this he declared the command and injunctions ordained for the people as equally applicable to his own self, she pointed out. Prof. Hashia maintained that this document had two parts. In the first part, there were 25 clauses which were counted as 23 by Wellhausen, whose numbering had been followed by all European writers. Dr. Hamidullah had advisedly retained this numbering of 23 clauses, so as not to confuse anyone availing of European materials, with this much of difference that he had divided certain sections into two by the signs (a) and (b), and this made the first part of the document to contain 25 clauses. The second part ran between clauses 24 and 47. But it had to be sub-divided into many sub-clauses. In Dr. Hamidullah’s count, this part really consisted of 28 clauses and thus the document consisted of 53 clauses in all. She said that the document had a clause which stated that in the event of dispute, the Prophet (PBUH) would be the last deciding authority. 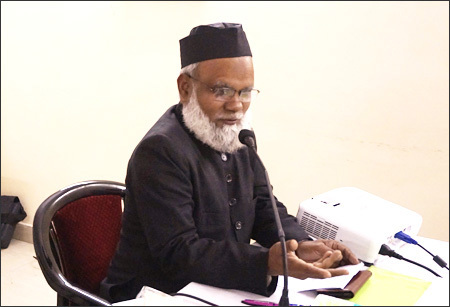 Dr. Raziul Islam Nadwi, Secretary, Tasneefi Academy, Jamat-i-Islami Hind, in his remarks differed with Dr. Hamidullah on several points. He said that Dr. Hamidullah referred to 46 sources which he used in the preparation of his work and completed it in 1938. He also contested the theory that the covenant was signed with the Jews. In fact, it was signed between the Mohajirs (refugees) and Ansars (“helper” of the refugees the Madinians), he said. 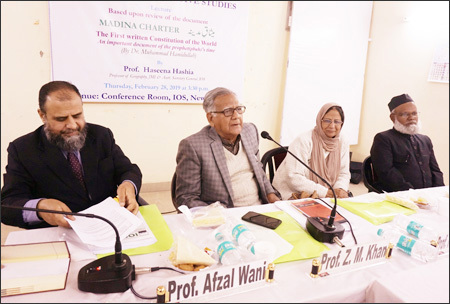 Vice-Chairman, IOS, Prof. M. Afzal Wani said that Dr. Hamidullah must be praised for presenting the spirit of Madina Charter before the world when he was only 35 years of age. He insisted that modern constitutionalism was based on the Charter of Madina and all Constitutions had benefited from it. It was really unfortunate that Muslims failed to take advantage of it. He called upon Muslims to develop their own charter based on the Madina Charter. He agreed with Dr. Raziul Islam that a critical study of the subject was imperative. He said that the charter was a movement for forging ahead with certain rules and regulation that bound the people together. Even the Magna Carta in England, supposed to be the harbinger of the modern code of governance and the rights of the citizens, came 600 years after the Madina Charter. Magna Carta coincided with the pact signed by the great sufi saint, Baba Fariduddin Ganj-i-Shakar with the then Sikh suzerain of the Fareed Kot area. 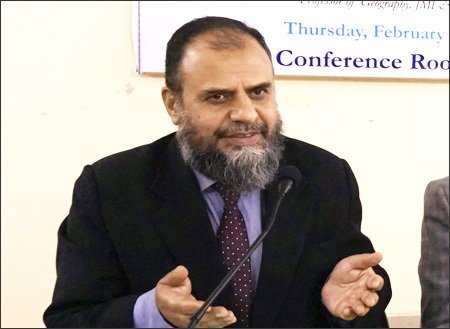 In his presidential remarks, Prof. ZM Khan, secretary general, IOS, said that Muslims should ponder over how the Ummah was living in a non-Muslim country as a minority. We should also think how a community could assimilate itself with the mainstream. He referred to his meeting with officials of International Institute of Islamic Thought in connection with the production of Islamic literature that could guide the Muslim community in a non-Muslim country. Referring to Western political thought, he said that the state was man-made and was amenable to change. But the Madina Charter was a different document, the spirit of which should be inculcated. Efforts should also be made to find the ways for using it for the benefit of the community. The message of Madina Charter must go far and wide, he concluded. Earlier, the lecture was preceded by the recitation of a Quranic verse by Hafiz Waseem Akram Nadwi. The subject was introduced by Shah Ajmal Farooq Nadwi. He also conducted the proceedings and extended a vote of thanks. The lecture was attended by Islamic scholars, university teachers, researchers, and university students.